Hawaii, Alaska, California and other parts of the Southwest face an above-average threat. A Cal Fire crew member in the area of San Marcos on April 18, 2016. California could face a dangerous and difficult wildfire season in 2016 despite a relatively wet winter, federal officials warned Tuesday. Most of the rest of the nation is expected to see an average summer, but even that means thousands of wildfires, U.S. Agriculture Secretary Tom Vilsack said after a briefing from the U.S. Forest Service, which is part of his department. A five-year drought has left 40 million dead and dried-out trees in California, including 29 million that died last year alone, Vilsack said. "This creates a tremendous hazard, potential hazard, for fires and firefighting this year," he said. An El Nino weather pattern brought near-normal snowfall to parts of California last winter, but its forests need much more rain and snow to recover fully from the drought, Vilsack said. Forest Service Chief Tom Tidwell said Southern California didn't benefit from the El Nino as much as the state's northern mountains. He said the effects of drought will continue to kill California's trees for at least three more years. Tidwell and Vilsack said the Forest Service -- the primary federal wildfire-fighting agency -- has 10,000 firefighters ready nationwide, along with more than 350 aircraft and 900 fire trucks. Wildfires are increasing in number and intensity in the U.S., and the wildfire season has grown by 78 days since 1970, Tidwell said. Last year, wildfires burned a record 15,800 square miles. 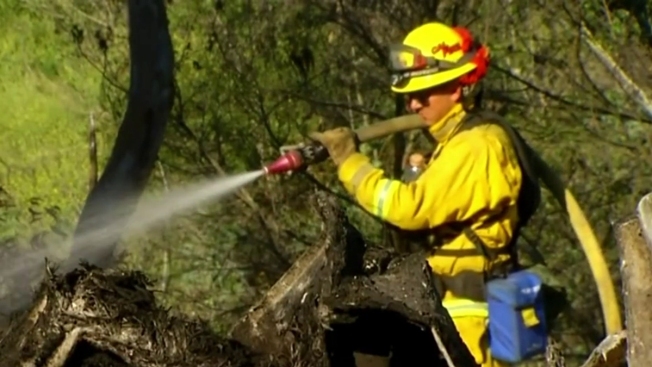 Seven Forest Service firefighters died and 4,500 homes were damaged or destroyed. Vilsack and Tidwell said climate change was responsible for the worsening fires. "This is not weather," Tidwell said. "This is climate change. That's what we're dealing with." Vilsack and Tidwell's warnings about the 2016 season largely echoed what forecasters at the National Interagency Fire Coordinating Center said two weeks ago when they issued their outlook for the summer months. They said Hawaii, Alaska, California and other parts of the Southwest face an above-average threat. The potential for significant fires will be below average for much of Texas, the South and the southern Midwest, they said. Sounding frustrated and impatient, Vilsack repeated his plea Tuesday for Congress to pay the cost of fighting the worst fires from disaster emergency funds, not the Forest Service budget. The Forest Service says the largest 1 or 2 percent of wildfires account for about 30 percent of the costs. Firefighting consumed more than half the Forest Service budget last year, draining money from forest management and other programs, Vilsack said. Fires will soon eat up two-thirds of the agency's budget, he said. "Congress has an affirmative responsibility and duty to fix this problem," he said. Rep. Rob Bishop, R-Utah, chairman of the House Natural Resources Committee, said money alone isn't enough. He said environmental regulations and lawsuits keep the Forest Service from culling enough fire-prone trees from the forests.